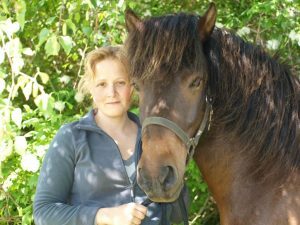 Karin is our accredited agent for Northern and Central Jutland and is also a well respected Physiotherapist for both horses and humans. “I live on a farm in the northen part of Jutland with my husband and our 10 icelandic horses. I have been a physiotherapist since 2003 – I have worked both in clinic and with disabled riders. In March 2010, I graduated as a equinephysiotherapist and since May 2012 I have been working full time with horses and riders. As professionally horseperson it is very important to me that my partners provide a high standard. Both because I want the best but also if I have to recommend a product i need to be 100% sure it works. I met Dean and Gini for the first time in March 2014 and was immediately convinced by their products and services. The first sadle I got was a pony dressage saddle and I experienced on my own horses, what a huge difference a good saddle does. In my work, I see a lot of horses with back problems due to their saddles, particularly Icelandic horses. In March 2016 came the prototype of the Icey Comfort saddle. This saddle is designed to be short on the horses back while providing plenty of room even for an adult rider. The seat is made so that the rider is not sitting on hip joints but on their pelvis. This means that the riders legs lay naturally down the ribcage of horse, without causing twist and pain in the knees and ankles. When the hip joint can move freely it is easier for the rider to be a natural part of horse movement. As a natural extension of my work as a physiotherapist for both horses and humans, I started to sell and fit saddles for Dean and Gini in June 2016. Kate, Jim and a saddle for a Dales Stallion.